What if you could find all your sources for milk, meat, eggs, cheese and honey right in your own backyard? You don't need acre after acre of land to provide for your household. 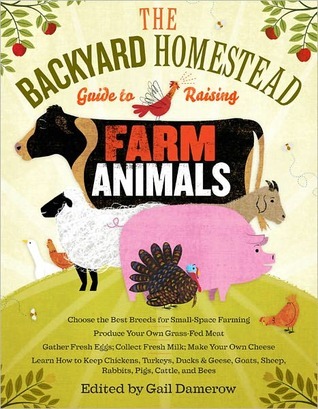 From honey bees to ducks to sheep to cattle, The Backyard Homestead Guide to Raising Farm Animals demonstrates that you can have a hand in your own food security. I was thrilled to get a copy of this book from Storey Publishing for review. I am a big supporter of buying local, and while I do not live in an area where I can own most of these animals (except bees, currently), I found this resource to be comprehensive for someone either researching or getting started in small-scale farm animal raising. Gail Damerow puts together a well-researched book on various farm animals that could be owned by people looking to find raise animals for food, but who do not necessarily have the space for a full farm. Each chapter takes a different animal and discusses what you may want to look for in breeds, housing, feed and basic health care for them. For instance, in the chapter on chickens there is a section on different breeds, how to collect eggs and check if they are good for eating, feeding, watering and housing your chickens, handling chickens in the coop and transporting them, and general health concerns. Additional chapters on other poultry such as turkeys and ducks follow. Poultry isn't the only meat souce in this book. It includes from the smaller "keep a couple in your garage" rabbits to pigs to cows. Sections on the various cuts from the animals are listed, but no need to worry about the details of butchering. Those are recommended to be left to actual processors or other books. The chapters on milk providers, goats and cows, give general descriptions on breeding and milking the animals. Beyond the individual animal chapters, I like the extras that are included. Similar to its predecessor, The Backyard Homestead, there are illustrations in the front showing how much you can actually support on one-tenth, one-fourth, or one-half an acre of land. The glossary is extensive but not overwhelming, the black and white line illustrations are descriptive and meaningful to the text, and the resources in the back supplement the strong foundation this reference creates. The Backyard Homestead Guide to Raising Farm Animals is a great source of information on chickens, ducks, geese, turkeys, rabbits, goats, sheep, cattle, pigs and honey bees, all of which are quite suitable to the suburban, or, if you are fortunate enough to have zoning laws in your favor, urban resident. If you are looking into owning any of these animals, I definitely recommend adding this to your shelf.